The best thing that has happened on Twitter this year (yes I know it’s only 4th January but I still think people will be hard pressed to beat it come December) is Richard Osman’s World Cup of Chocolate #WCOC2016! It started on New Year’s Day with the Group Stages which involved 8 Twitter Polls of 4 chocolate bars each. The top two in each group went through to the next stage and so on until the winner was announced on the evening of 2nd January. Cadbury Dairy Milk was the victor. I agree that it’s a great chocolate bar but if I’m honest I never really recovered from Double Decker crashing out in the group stages – unbelievable! It was a fantastic idea from Richard, which generated over 1.1m votes in the 2 days and so much conversation across the platform. Some great tweets from people reminiscing about previous world cups or talking tactics like Maltesers being too light up top. I really can’t wait for the World Cup of Crisps at Easter! As a Twitter user I was fully involved in the whole thing. As a marketeer I was actually gutted that I don’t currently work with any brands who could get involved. One of the first things that I did when I saw it unfolding was to start searching the chocolate bar brands to see what they were doing on the platform. This is the sort of publicity that you dream of as a marketeer. Your product voluntarily being talked about and an opportunity for you to engage with your consumers in a fun non-shoehorned way! 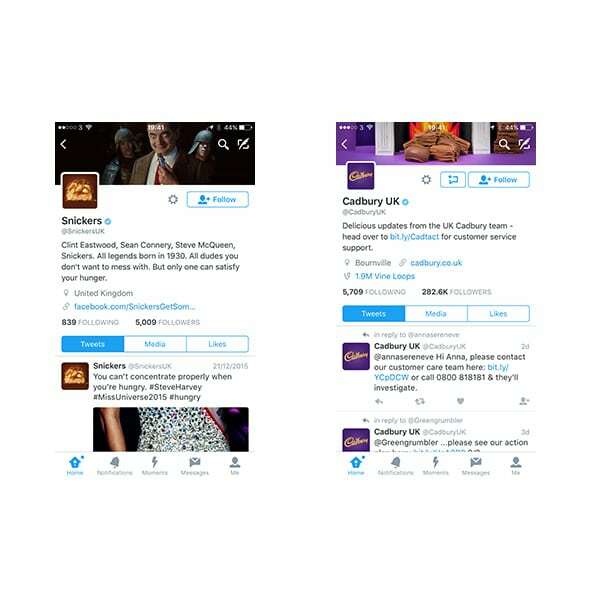 So I was absolutely amazed to see that Cadbury UK hadn’t tweeted for 3 days and Snickers hadn’t been around since 21st December. Not all the chocolate bars have accounts which is fair enough but I couldn’t believe the big boys weren’t getting involved. It was only yesterday when someone at Cadbury’s was perhaps thinking about coming back into the office that they tweeted Richard to say they were celebrating at HQ. No tweets to the public to thank them for their votes though – so still a missed opportunity in my eyes. The one brand who did get involved in an absolutely brilliant way was Betfair. They actually ran a book on the whole event and tweeted their prices each time the new round was announced. This added a great extra dimension to the tournament and I’m sure it got them new customers too. They made £2,000 on losing bets, which they announced at the end of the tournament, would be donated to charity. Richard Osman also asked people to donate to his chosen charity Child’s I Foundation– definitely worth a few quid if you enjoyed the event. So why didn’t the chocolate bar brands get involved? I can’t be sure in this exact instance but one thing that always surprises me is the amount of people in digital roles who are not personally on the major social platforms. This raises an interesting point – it’s true that you can work in marketing and not necessarily be a consumer of the product you are selling – but I do think that people should immerse themselves in the platforms that they use professionally. By putting themselves in the consumer’s shoes they will be able to generate far better ideas of how to use them. When more senior marketeers don’t ‘get’ or like particular platforms, interns or grads are often given responsibility for the social media channels because they are ‘millennials’ and use them personally. That’s fine but what you miss then is the marketing experience to know a good opportunity to jump on and you also get people who are not paid that much and so will be completely switching off during their holidays. Social Listening tools can be really useful in this instance as you can set alerts so you know when your brand is being talked about which saves you from physically having to check yourself. Another option is to find a great agency who really understand the platforms and who can be on the clock constantly to make sure they take advantage of opportunities. Like it or not, we are connected 24/7 now and the brands who win in the end, will be the ones who are agile enough to make the most of every opportunity. Great article, good points. It was indeed fun, shame something as mundane as a plain old chocolate bar took out top spot… a nation of traditionalists to the end (no matter how much we embrace social media! ).